What an idiot I am! Today while mowing the lawn, I saw a clump of weeds along the chain link fence that I just had to trim. So I ran the mower over them; and in the process, chewed up the feedlines to both my G5RV and the Butternut vertical! Talk about wanting to kick yourself in the behind! Fortunately, all was not lost. I took the coax to my 2 Meter antenna, which I never use and hooked it up to the feedline leading to the Butternut. I cut the Butternut feedline above the mower damage and installed a PL-259. Then I used a barrel connector to attach it to the 2 Meter line. Done! I switched the coax from the VHF radio to the HF radio and it worked just fine. For the G5RV, I used the piece of coax that was feeding the Butternut last year. I was having trouble with that coax and found the problem area. I cut away the bad part and the balance was just sitting, coiled up and tied to the fence. I put a PL-259 on that and pressed it into service. Voila! It works! It's mini RG-8X and will serve until I can afford some RG9913 or LM283 or something like that. For safety, I took the coax and tie-wrapped it along the top of the chain link fence. Now it's no longer at ground level and this unfortunate incident should never happen again! I knew I was going to have a busy day with mowing the lawn and repairing the grill. The day got much busier than I had intended! Makes a body feel good! I had an excellent QSO last night with Dave KK4PQ from down in Albany, GA. 20 Meters was open nicely last night; and Dave answered a CQ that I put out. Dave was using a Yaesu FT-817ND at 5 Watts to a Vee beam. He had a killer signal into New Jersey; of course, until the band changed and killed us both. But it gets better than that! This was Dave's first CW QSO in about 10 years; and I was to have the honor of being the lucky op to work him! He apologized for his fist, complaining that he was rusty. There was nothing to apologize for! And if Dave was rusty last night, I'd hate to have to work him when he's at top form. I'd probably get blown away! His fist was truly excellent and a joy to copy. If you ever hear KK4PQ calling CQ on the bands- rush right on over to work him. You're in for a treat! Sunny and 72 degrees during lunchtime. Set up the K1 and the 20 Meter Hamstick on the Explorer. Had a really nice QSO with Jim W9KRH down in Weeki Wachee, FL while munching on a ham & cheese sandwich. What a way to spend lunch .... warm weather, sunny skies, good food and a good conversation. I remember being in Weeki Wachee about 37 or so years ago, on vacation with my family. I remember going to see the mermaid show at the Spring. Jim says it's still going on, although he hasn't gone in years. He lives about three miles from the Spring. A quick Google search showed that the attraction is bigger than when I was a kid! Jim was a solid 589 and he gave me a 579. Not bad considering there was an M Class solar flare earlier this morning. The effects must have passed; as I heard a decent number of signals on 20 Meters. I was able to get on the air for just a lil' bit last night. The Mets game went into extra innings and I had to see the end. Yes, my number one outside-of-Ham-radio preoccupation is baseball in general; and the New York Mets in particular. In fact, this summer marks the 39th anniversary since I went to my first ball game at Shea Stadium. I remember it like it was yesterday! My dad took me on his day off and we saw a weekday double header against the Houston Astros. Rookie phenom, Tom Seaver, pitched one of the two games. I was hooked for life! Anyway, I digress. When I finally did get the K2 fired up, I was treated to the sounds of many European and other DX stations on 30 and 40 Meters. With much difficulty, I worked IK2DOT on 30 Meters. I was pretty tough to hear with my 5 Watts signal. Originally, Carlo gave me a 119 report and was ready to QRT with me. That's when I realized I was on the G5RV. For whatever reason that is beyond my puny amount of antenna knowledge, the G5RV just does not play well on 30 Meters. I quickly switched on over to the Butternut HF9V vertical; and my signal must have literally jumped up! Carlo related to me that he had a good copy on me after that. We exchanged the standard pleasantries and then we signed. As nice as it was to get that one in the log; I wish that DX stations would ragchew more. When my QRP signal makes it overseas with some decent strength; it would be nice to learn a little bit more about the op I'm working other than "UR 599 TNX QSO DR OM". Frustrating! This appeared on the FISTS e-mail reflector yesterday. It was posted by Nancy WZ8C, the head of FISTS North America. It is so difficult type "G3ZQS" and "Silent Key" in the same sentence. But I just heard from Geo's son that Geo became a Silent Key at 7, UK time. As I had written to you yesterday, Geo had a heart attack last Saturday and had been in and out of consciousness all week. re-committing to this FISTS philosophy and making FISTS even stronger, in remembrance of Geo's vision. For those not familiar with the parlance, a Silent Key is a Ham who passes away. He cannot send code anymore, thus his key becomes silent. 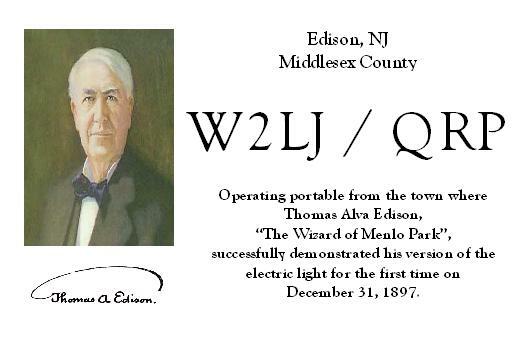 I never met George; or even had a QSO with him. But I have been a member of FISTS, his brain child, since 1993 or there abouts. I'm not really sure whether it was 1993 or 1994 when I joined. Nevertheless, I have enjoyed my time as a FISTS member; and that is a direct result of George's efforts. 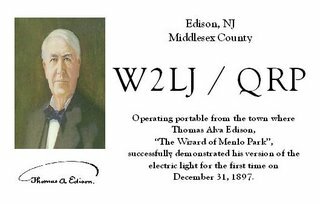 His influence will be missed; but the mission continues - to preserve, protect and defend the use of Morse Code in Amateur Radio worldwide. I was just reading my e-mail; and I saw a post to the SolidCopyCW group by my friend, Dan Romanchik KB6NU. In the signature line of his e-mails, he labels himself a "CW Geek". Cool, Dan! I think I'm going to have to start paying you a royalty fee for that! Here's a link to Dan's blog; entitled appropriately enough - KB6NU's Ham Radio Blog . One of THE best Amateur Radio blogs on the Web, IMHO! I guess that most QRP operators (myself inlcuded, tend to forget that not everyone has the QRP "mindset". 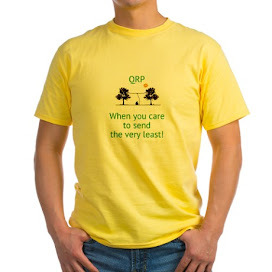 What is the QRP mindset, you may ask? Let me take a few minutes to try and explain why it is that we do what we do. 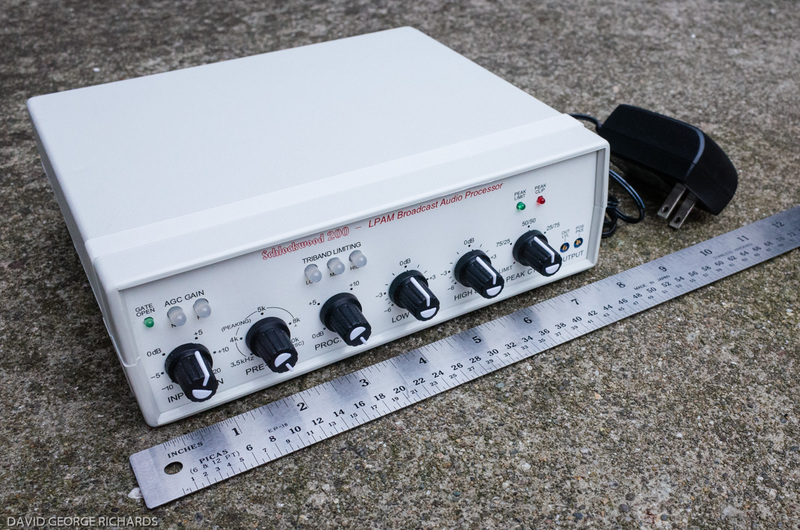 1) QRP operators love to use low power, that is 5 Watts or less when using CW or the digital modes and 10 Watts or less when using SSB. Some of us use it out of necessity. Some QRPers live in places where Amateur Radio antennas are not allowed. These folks use "stealth antennas' and use low power so they cannot be detected. The rest of us? We just love using low power for whatever reason! The challenge is to maintain RELIABLE and QUALITY communications with low power. Efficiency is our passion. Others of us love the idea of establishing radio communications using minimalist equipment; and then there is an entire branch of us that lives to take small radios and light, efficient antennas out to the great outdoors to operate while hiking, camping or just anywhere outdoors! 2) Please do not mistake QRP operating with weak signal operating! QRPers do their utmost to maintain and produce a clean, readable and reasonably loud signal. We understand in many cases that our signals may not be 599; but in the same vein, we're not sadists who live to torture the unsuspecting Ham with sub-par signals! However, in the event our signals ARE weak, you won't offend us if you choose not to work us. We realize that while our QRP sigs might not be loud to QTH "A"; they might very well knock the headphones off of Joe Ham at QTH "B"! This is an article about the ionosphere and how the sun affects it and radio communications. It is the best article in easy-to-understand-everyday-English that I have ever read on the subject. 4) QRPers do the best they can to learn the characteristics of their stations and antennas. QRPers take great pains to make sure that they squeeze every electron out of their antennas. If you spend any time on the various QRP e-mail reflectors, you will see more posts about antennas and receivers than just about anywhere else. And the experts abound! You can learn so much from these guys; and the giants of QRP are more than happy to share whatever they have learned over the years. 5) By their nature, QRPers tend to be builders, tinkerers, experimenters and tweakers. This is all done to maximize efficiency of equipment and antennas - to get, in essence, the biggest bang for the buck. The side benefit of this is that if you're having trouble with a piece of your station equipment or antenna; then go and find the nearest QRP enthusiast! If he or she can't help you themselves, they'll probably be able to point you in the right direction to clear up whatever problem you might be having. 6) Since QRPers are familiar with weak signal work, they tend to become first rate, top notch Amateur Radio operators. The best of the best can dig out signals from below the noise floor so well that you would swear they use ESP! 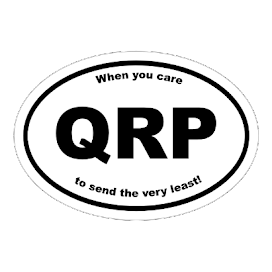 In fact many QRPers tend to use just that term! Signals that are just barely audible are said to be at "ESP level"! Also, since the majority (but by no means all) of QRP operating tends to be using Morse Code, the best of these guys have the most outstanding fists! The Morse flies out of their fingers like music and their CW is an absolute joy to copy and listen to. 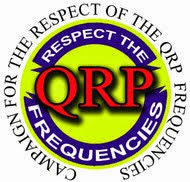 All the above being said, QRPers tend to be very enthusiastic about not only QRP; but about Amateur Radio in general. The majority have the "spirit of Amateur Radio' that was handed down to us by the great Hams that came before us. Our enthusiasm is infectious; and we hope we can relate that enthusiasm to the rest of the Ham population. I've been using my reconditioned Vibroplex Original for about a month now. It's been a lot of fun to use and I've been enjoying the heck out of it; but something has been nagging me - something hasn't been quite "right". I took the time out the other night, to look over things with a "fine toothed eye" as it were; and I found out what wasn't right. When you make a "dah" you push the paddle to the left. The "dah" contact is on a swing arm that should push away from the main part of the pendulum. There was such an amount of rust there; that the "dah" arm wasn't swinging away from the pendulum. I had to swing the entire pendulum to the left to make a "dah"; and that's not correct. I took the pendulum off the base and squirted a ton of Liquid Wrench in there. It got it to the point where the "dah" contact arm did come loose; but it wasn't swinging freely like it should. It would swing out all right; but would "click" into place and required a lot of force to bring it back to normal. The "dah" tension spring should provide enough force on its own to do that under normal circumstances; and there was no way ANY spring would provide enough return force as things were. I decided that I was going to order a new trunion pin from Vibroplex. I would take the old one out and seperate the "dah" arm from the main pendulum, clean it all up, and install a new trunion. In the process of beginning to tap the trunion out, I must have dislodged whatever rust or foreign matter was there. The "dah" arm was now flopping around freely; just as it should. I carefully tapped the trunion pin back to the correct location; but in the process of hammering, I flattened out the pivot points! Thank God for Dremel tools! I grinded the ends of the trunion pin to finer points and reinstalled everything where it belonged. The Bug is working 100% precent properly now. The code is coming off much smoother, less herky-jerky; and sounds much better now. I was always wondering why I couldn't transition from "dahs" to "dits" more smoothly - now I know! The restoration is now complete; and I've learned a thing or two or three in the process. How cool is that? Today it reached about 75 degrees during luchtime; so I went outside and fired up the K1 at the back of my Ford Explorer. This time I had success! I called CQ and was answered by John VE7CBU in Vancouver, British Columbia. Not bad for 5 Watts to a Hamstick mounted on top of an SUV! I gave John a 589 and he gave me a 539. Then he proceeded to turn his power down to 5 Watts. Guess he wanted to give me a taste of my own medicine! I had solid copy on him; which was rough on my part, but I managed. Unfortunately, I was not in the confines of my nice quiet shack located in my basement at home. I was in the parking lot at work, sans headphones while at the same time a freight train was blowing past me on the tracks which are located a couple hundred feet behind our building! It made it a tad rough for copying; but I guess that's what we portable QRPers live for! Next time, I'm going to have to remember to pack my headphones in the rig box. Today it is about 69 degrees during lunchtime. So I decided to go out to the Explorer during my break and fire up the K1. The weather was superb! Sunny and warm with a slight breeze. I could have easily chucked the light jacket I was wearing. Almost ideal. The band, however, sucked. Turning the dial up and down throughout the 20 Meter band yielded nothing. Absolutley nothing. Well almost nothing. I heard quite a pileup down at the bottom of the band. I would assume that that was the VU4 DXpedition on the Andaman Islands. I didn't hear the fox; but I did hear the pack trying to get a nip of the quarry.